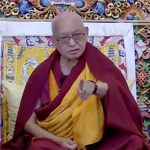 Posted in Rinpoche Available Now. From December 6 to 16 Lama Zopa Rinpoche taught extensively during the 51st one month November course at Kopan Monastery. The Long Life Puja was held on December 17th.